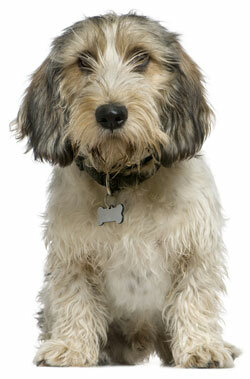 The Petit Basset Griffon Vendeen, or "PBGV," is a happy, outgoing, busy, independent, alert and lively dog. He is very curious and always seems to be exploring, sniffing, and looking for something to do--or someone to play with! He loves attention and affection, and wags his tail exuberantly to show his enthusiasm. He is a loyal dog who wants to be part of his family's life, and who hates to be ignored. He is not a dog who can be left alone in a yard all day. When bored, he becomes mischievous, and will bark, howl, or dig to escape. He has a very musical hound's voice that he uses to demand your attention. He loves and needs human contact, and is a very sweet and social dog with both his family and with strangers. He is composed and gentle with visitors, and for this reason makes a wonderful therapy dog. He makes a very good watchdog because he is alert and because he usually only barks for a reason. But he is not a guard dog, as he is more likely to wag his tail at intruders than confront them! He is not a yappy dog. He is vocal at times and can howl and bark too much. A very high-energy companion, he needs a great deal of physical and mental activity. He is a tough, hardy dog with a strong work ethic. He is not a couch potato. He needs a daily walk and chances to run and explore in a secure area. When outdoors, he should always be on a leash or behind a fence, since he has very strong hunting instincts and will chase after any scent or movement. Once he picks up a scent, he may not come back to you when called. He is generally good with other dogs but can't be trusted with smaller, rodent pets. He can tolerate cats if raised with them as a puppy. He is challenging to train. He is willing to please you, but also has a very strong mind of his own. You will need a consistent, positive approach to teach him obedience. He is good with children and has a natural affinity for them. He is best with older kids, however, because of his tendency to play-bite, and he should always be supervised when around youngsters. He practically doesn't shed, and so would be a good pet if you like your house neat and clean. The Petit Basset Griffon Vendeen is 13 to 15 inches tall (to shoulders) and weighs 31 to 40 pounds. He has a double coat consisting of a medium-length outer coat and a short, thick undercoat. His coat color is white with lemon, orange, black, sable, or gray, or may be tri-colored. The Petit Basset Griffon Vendeen can be traced back to the 16th century and to his larger relative the Griffon Vendeen. He was developed along the western cost of France to hunt by scent, and he is still used there to hunt rabbit and birds. He's only recently become well-known outside his native country, and is growing in popularity as both a working and companion dog. The PBGV Club of America was formed in 1984, and he was admitted to the AKC in 1990. His AKC popularity was 120th out of 157 breeds in 2007.